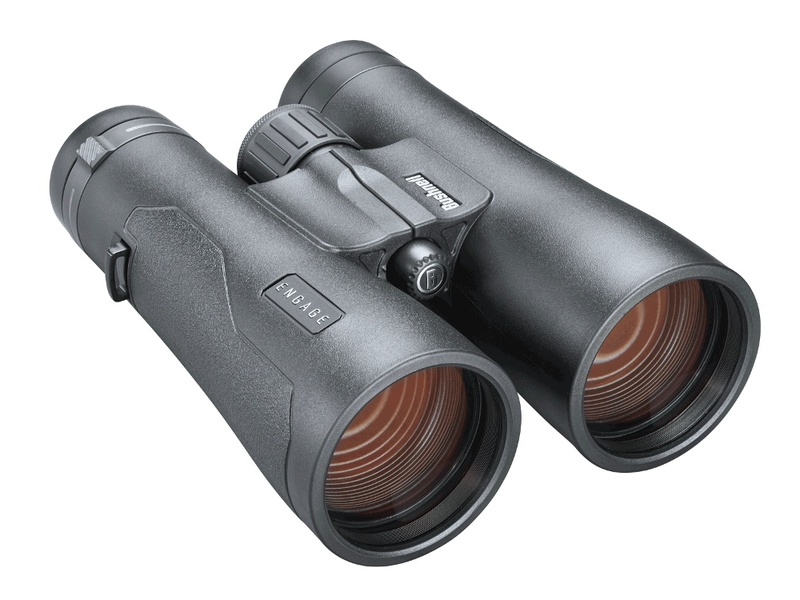 Bushnell Engage 12x50 - binoculars specification - AllBinos.com . Cons: The usual ones associated with a high power, namely hard to stabilise, poor depth of field and small field of view. Pros: Optically very decent, I\'m reserving 5s for totally flawless but these really are very good. Sharpness and chromatic aberration correction of centre-quality until the outer 80% of field, not to shabby on the edges. Color rendition appears to be neutral and bright. Although contrast declines with bright light close to axis the stray light is not too badly handled badly and an effect you\'ll see in any pair of binoculars. Field of view of 5.3 for its class is pretty good - apparent field of view of 64 degrees. Pupils perhaps slightly truncated, worse in the left side (maybe the central focus mechanism is housed there?). They feel well made and are reasonably light weight. I can hand hold them but prefer to use these in conjunction with a monopod and a mounting plate with straps. (There is a bush mounting but it\'s very hard to tighten it because the 50mm objectives are very close together - also I\'d rather not keep mounting and unmounting binoculars in a manner that would erode the thread). A 12x is not a general purpose instrument - it\'s a little high for regular unsuported use but they work well for me as a professional bird surveyor watching from fixed vantage points. Summary: A very good reasonably priced pair of high powered binoculars - I expect the rest of the range will also be very competitive; if they can control aberrations on their highest power model any problems are likely to be even harder to discern when less magnified. Well done Bushnell.